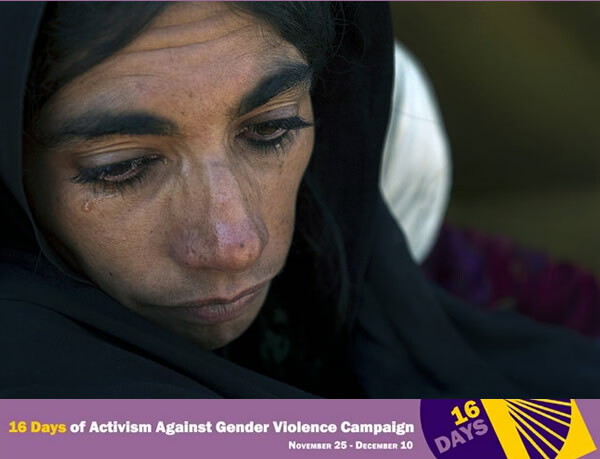 Afghanistan is a country where you can really find the meaning of gender violence. I want to discuss gender violence in three areas: the education system of Afghanistan, the joint family system, and our society. Regarding gender violence in the joint family system, the problem that bothers us is that in our marriage system, a man may take as many as four wives at a time. This rule troubles us because a man with four wives can’t treat the women equally. Fighting begins in a household and everyone is affected—the daughters and the sons. Gender violence in a family often occurs because the man of the household thinks that women are only a toy or a piece of equipment for his use. The other major problem is that when a daughter marries, her father receives money from the girl’s new husband. This really proves that girls are nothing but a doll or piece of equipment that the father can sell to an interested buyer. I know many girls who are complaining about experiencing gender violence in their homes. They say their fathers pay no attention to them because they say girls are just a guest in the house until they leave to join their husband’s household. I know one woman who says she would prefer death. She tried to burn herself because she could not continue suffering from her husband’s violence. Women are known for washing clothes, having children, and cooking. But it is not written on the forehead of a woman to do these things. In villages, women even don’t know what their rights are or why they came to the world. They think that they were created only for the housework. Gender violence affects our society economically, politically, and socially. I know that women and men should be treated equally in all areas of the life. But in Afghanistan, women are better known as a symbol of violence and suffering than of passion and humanity. Women are human. I am dreaming for a day to be treated like a human being and be counted as human in my society. I have a dream to become an obstetrician and work for the women of my country—and the world. Afghanistan leads the world in its maternal mortality rate. This is a result of the gender violence that forces girls to marry at age fourteen or fifteen, an age too young for delivering babies. The babies are the future light of Afghanistan. I don’t want them to die before they enter the world. I have suffered from harassment on the streets because I am a girl. The men who bother me now should realize that tomorrow I will help their sisters and mothers and their wives and treat them. Today they try to interrupt my studies and burn my school and my books so that I cannot get educated. We need to really focus on men and women equally and let them live freely. I dream for a day when men and women work together without violence and discrimination. I dream for a day to be known as a human who counts not as a piece of equipment to be used. I dream for a day to be educated and count as a valuable person in my society.